This is what Piper’s big sister does with her own hoarding. She creates sockfits, which is a full line of Barbie clothing made out of mismatched socks. She designs and sews them herself. Somehow, this hobby has moved my response from reproachful disdain to admirable frugality. Our friends now save the orphaned socks from their laundry and bring them over to our house for fashionable recycling. Piper’s hoarding, though, hasn’t yet evolved. She’s still in the denial phase. She doesn’t have a problem. Isn’t it normal to sleep in a bed with 34 stuffed animals? And doesn’t everyone need seven baby blankets to keep warm at night? There’s hardly a spare inch in the bed for the little hoarder. And that’s exactly as she likes it. This entry was posted in Antics and Adventures and tagged barbies, dirty socks, hoarding, ottoman, piperism by melissa.scholes.young. Bookmark the permalink. Perhaps we are the ones who have the problem. We don’t see the amazing possibilities of week old cereal and dirty socks. My children are both hoarders. There is so much stuff stashed in every corner of the house. 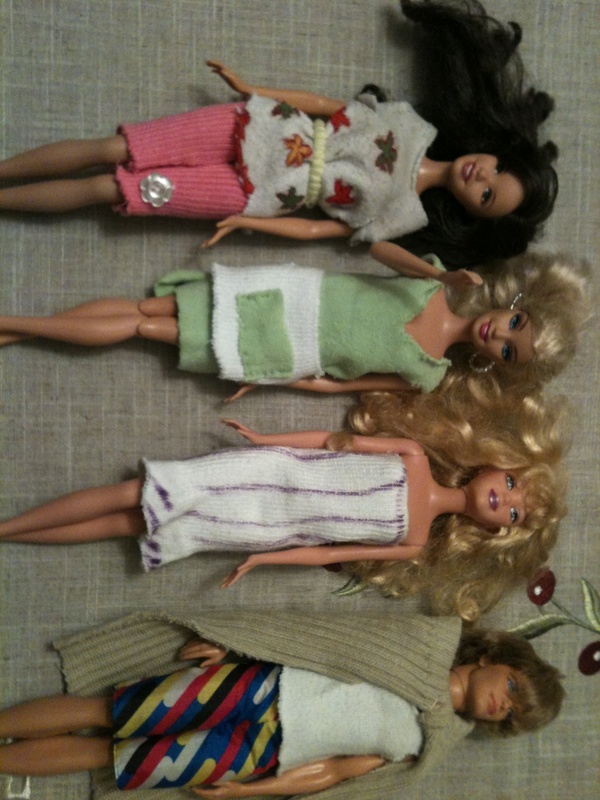 The Barbie sock clothes amused me. My daughter made sock clothes for her Beanie baby animals. Not as Project Runway chic as your daughter’s, but there were head bands, mini skirts and tube tops. It was fun for like a whole weekend. 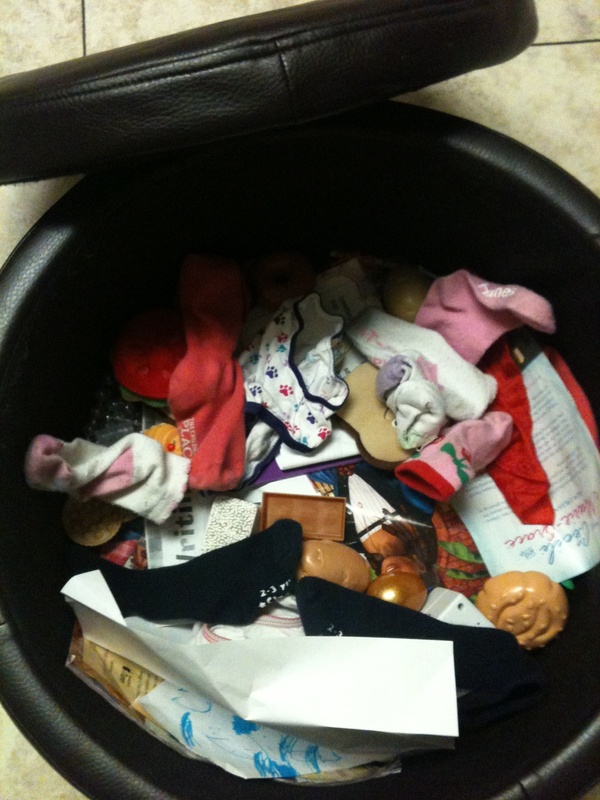 now I just find sock remnants and half dressed Beanie babies in random places. I’m the opposite of a hoarder. When I get out a plastic bag, my kids run the other way to protect their toys from the trash. Can’t say that I blame them. She’s quite the seamstress. I can’t even sew on buttons straight. The sockfits are a hoot! I love Isabelle’s sockfits. They’re neato. Thanks, Rachel. Maybe Jack and Isabelle can add sockfits to the items they’ll see one day in their bakery boutique. It’s going to be quite the place! I know the blog post is actually about Piper but those upcycled sock outfits just rocked my world. I love that Isabelle. Aren’t they amazing, Eva? I need you to come over and help Isabelle learn how to operate her new sewing machine. Please! I found an awesome project for Isabelle! It’s a whole doll house, furniture included, built solely out of paper egg cartons. Isn’t that wild? Here are the links.